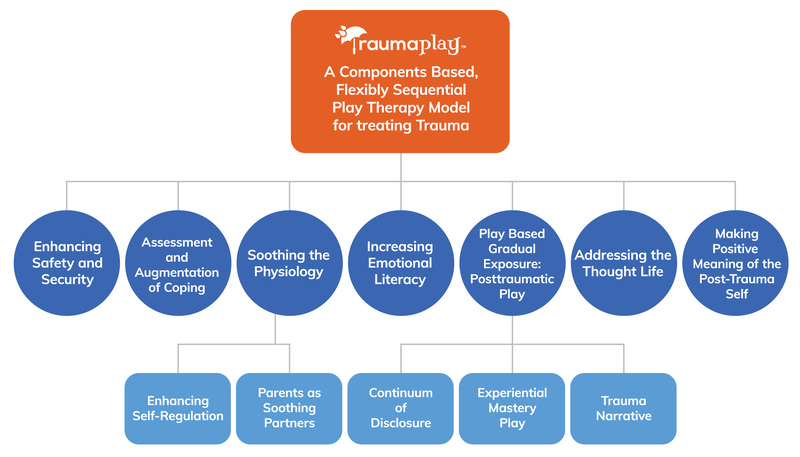 is a flexibly sequential play therapy model for treating traumatized children that has been in development for the last 20 years as Paris Goodyear-Brown has worked with children and families with complex trauma to integrate several evidence based treatments into a developmentally sensitive play-based treatment continuum. is informed by our current understandings of the neurobiology of play and the neurobiology of trauma, and is built on the power of one to heal the other. Grounded in attachment theory, the child or family is met moment-to-moment as therapeutic needs are assessed. The framework of seven therapeutic treatment goals serve as the umbrella under which clinicians have freedom to employ a variety of interventions. A subset of goals related to enhancing the role of Parents as Partners expands clinicians’ finesse in integrating parents into trauma treatment. allows room for both non-directive and directive approaches to be employed and incorporates clinically sound elements of other evidence based treatments such as Child Centered Play Therapy, Theraplay, and Cognitive-Behavioral Play Therapy, while offering original interventions that were developed in real-world clinical settings to maximize therapeutic absorption through every play-based learning portal. This training will equip clinicians with a wealth of targeted techniques that are tied to the model’s umbrella treatment goals. offers a best practice framework for trauma work with families while encouraging ongoing assessment and offering flexibility to the clinician to tailor treatment to the needs of individual families. See the flowchart below for a better understanding of the treatment continuum. A master’s degree or higher in a mental health field. Licensure in a mental health field that allows you to work independently. Training and consultation can be accrued as licensure hours are being accrued, but a Certificate cannot be granted until a graduate is independently licensed. Nurture House, the home of , is an APT Approved Provider. Trainings sponsored by Nurture House that support TraumaPlay SM Certification can also be counted towards your Registration as a Play Therapist. Three day live training totaling 20 hour CE credit. Payment of $550 is due prior to beginning the live weekend. Between the foundational and advanced trainings, participants will read Trauma and Play Therapy in its entirety and complete homework assignments/quizzes on all nine chapters. Participants accrue 9 more CEs upon completion of the assignments. Up to five hours of supervision can be group supervision. The fee for group supervision is $50 per person. The range for individual supervision is anywhere from $60-$150 per individual supervision based on the supervisor you choose. Advanced three day live training totaling 20 hour CE credit. Payment of $550 is due prior to the beginning of the Advanced training. Payment of $50 for the 9 CE hours is due prior to taking the online quizzes. 10 hours of consultation/supervision while applying the model in at least 30 clinical sessions, core competencies covered in the first live training (see detailed breakdown of content covered in each training) will be assessed through videotape review. In addition, participation in/review of the 1 hr monthly webinars is an expected part of the certification process. A span of at least six months is needed between the first and second live trainings in order to make sure that clinical application and consultation is accomplished and that learning and skill enhancement builds in a scaffolding fashion. Another six months of consultation and clinical application after the second live training can also be expected. Participants in the certification program can expect a year’s time to complete training and consultation after the preparatory homework assignments are completed. Before attending your first live workshop, you will read the volume Play Therapy with Traumatized Children in its entirety. At the end of each chapter, there will be an assignment that requires reflective writing as well as a quiz answering a series of multiple choice and true/false questions. Mastery of the written content, as supported by completed assignments admits you to the live training. In the event that you have an opportunity to attend a live training prior to deciding to become certified, completion of the written work will need to be completed within six-weeks of the initial live training attended. (As the text has 12 chapters, 1 hour of CE is awarded as each chapter is read, the associated assignment is completed and graded.) TraumaPlay TM reserves the right to deny entry into the live training phase of learning based on sub-standard completion of any written work. Attend an initial three-day training, equaling 20 hours of continuing education. Each component of the model will be taught through lecture, demonstrated live, or through video clips and case examples, and experienced in dyads or small groups, so that didactic teaching is augmented with live practice by participants. Specific skill sets will be assessed longingly and will help clinicians show proficiency will clinical skill sets and the application of specific interventions. What do we mean by Flexible and Sequential? Attend a second three-day training that totals 20 hours of continuing education. Part 2 training will build on initial skills, work with advanced applications of the model and how to modify it for special populations. Bringing clinical nuance to all components of the model will help clinicians go deeper in their application of treatment components to a variety of presentations. Please click here to apply or e-mail training@nurturehouse.org with questions.